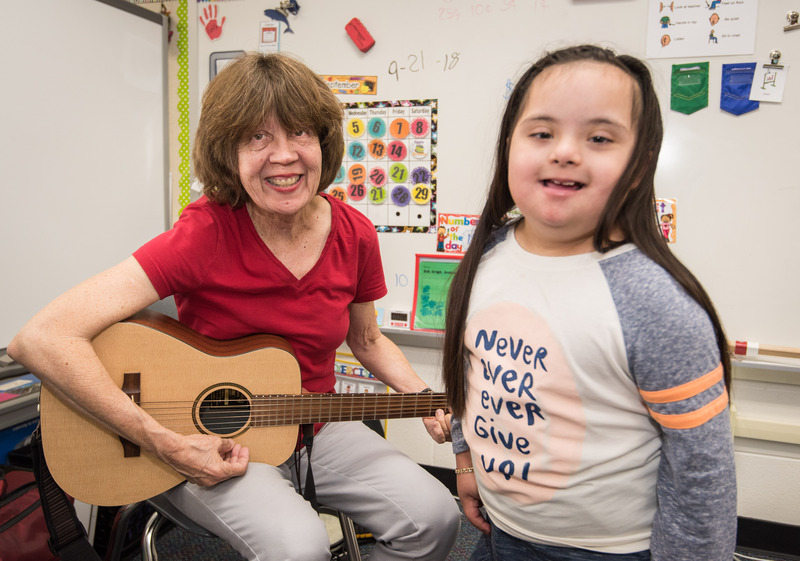 Music is the great motivator, and HCDE music therapist Ann Petty has used her music therapy training to benefit students in the classroom for 25 years, with 15 exclusively in Cypress-Fairbanks ISD. She begins the day with Bella, 6, a wide-eyed, jubilant child at Hairgrove Elementary working with Petty in her life skills classroom. Bella repeats phrases and works on looking in the direction of the speaker. Later, she sings and plays the tambourine and drum. Petty travels to three-to-five Cy-Fair ISD campuses a day and works with both students and their teachers, implementing activities that will support academics, social skills and communication. She also uses neurological principles for improving communication, psycho-social and cognitive skills. Students may be getting a song strategy for counting nickels or learning an algebraic formula. Another who has attention-deficit disorder works through a music routine so that he can participate in a classroom session for up to 20 minutes. “When I see that he is able to fulfill that goal, I know that is progress,” Petty said. Like her counterparts who practice physical and occupational therapy, Petty must evaluate students. She will support Individualized Education Program goals and objectives prepared for students with special needs. Her responsibilities include documenting progress and collaborating with other therapists, teachers and paraprofessionals. A music therapist holds a bachelor’s degree or higher from a college or university approved by the American Music Therapy Association. Upon graduating, a music therapist is eligible to sit for the board certification exam granted by the Certification Board of Music Therapy. HCDE has five, full-time and three, part-time music therapists working within contracted school districts. There are over 150 physical and occupational therapy providers within the HCDE division. Therapists work on school campuses to provide 53 percent of special education therapy services provided to the students in our 25 Harris County school districts. Cypress-Fairbanks has contracted with HCDE School- Based Therapy Services for 40 years. Petty enjoys collaborating with staff in Cy-Fair and appreciates the resources and support she gets within the HCDE and Cy-Fair partnership. “We’re always problem-solving and figuring things out together,” she said. Bella sings the spider song. She learns directions like up and down and is sharing the names of other insects in the spider’s ecosystem. As a reward, she may play the rhythm sticks but must use her social skills. The music stops after a half-hour. Petty packs up her portable classroom for her next client. Bella’s teacher begins to reinforce what the little girl has just learned. Hugs and salutations go around the classroom from the music therapist named Ms. Petty, the music-maker.